Manufacturing Center-Shenzhen Jinrui Energy Technology Co.,Ltd. The company headquarters has independent modern factory buildings, automated production lines, and advanced computer program-controlled testing equipment. The automatic testing equipment, wave soldering, reflow soldering, SMT, reliability safety test room, environmental testing instrument and other advanced testing equipment are strictly controlled and inspected, which provides effective guarantee for product quality. The company continues to expand production scale and power supply. The annual production capacity of adapters, LED drive power supplies and consumer chargers has reached a certain scale and has increased year by year. 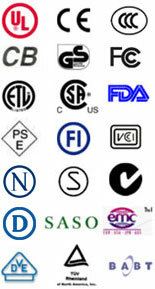 The company's products are sold to the global market and have obtained safety certifications from many national authorities, including UL, CB, CE, FCC, GS, PSE, CCC, C-UL, SAA, etc., and have passed the international IS09001  quality management. System certification and ISO14001: 2004 environmental management system certification.